Here are some great Bullying Facts For Kids that we can share with our children. These facts can help us teach our kids how real this is, and how they can fight against it. With bullying impacting up to 75% of our school aged children each year, it is already of epidemic proportions. Preparing our kids with facts and information before they are hurt by a bully is important for our peace of mind as well as theirs. A child who is educated and knows what to watch for can help not only themselves, but others. Bullying can be physical, emotional (verbal), or sexual in nature. Make sure your children understand that bullying isn’t just when a bully hits them, shoves them or slaps them. Bullying can also come in the form of words in a verbal manner that hurts emotionally. Being made fun of in a derogatory persistant manner is the most common form of bullying. Sexual bullying can be about a lack of or significant sexual experiences. Sexual bullying is also an area where those in the LGBT community are bullied the most. Being picked on due to sexual preferences is a more common form of bullying today. Teaching your children signs of what each of these types of bullying are will help them to understand and realize when it is happening to them or their friends. Bullying comes from strangers and “friends”. A bully doesn’t have to know you in real life or see you physically to bully you. Cyberbullying is a common occurrence that happens to children as they learn to navigate online with other people. Bullying doesn’t come just from strangers or enemies. Bullying can happen in peer groups with those you consider a friend, as well as inside your family with siblings, parents, cousins or other relatives. Just because a teacher says it isn’t bullying doesn’t mean you shouldn’t report it. Since 1 in 4 teachers see nothing wrong with bullying, and that bullying isn’t an issue in schools, there can often be a problem when your child steps up to report a bullying incident. Make sure that your child knows no matter what the teacher says about an incident, they are doing the right then when reporting it. They also need to know they can always come to you with information about bullying and you will go to bat for them. Kids don’t understand statistics and numbers like adults will regarding bullying, but they do understand that changes need to be made. 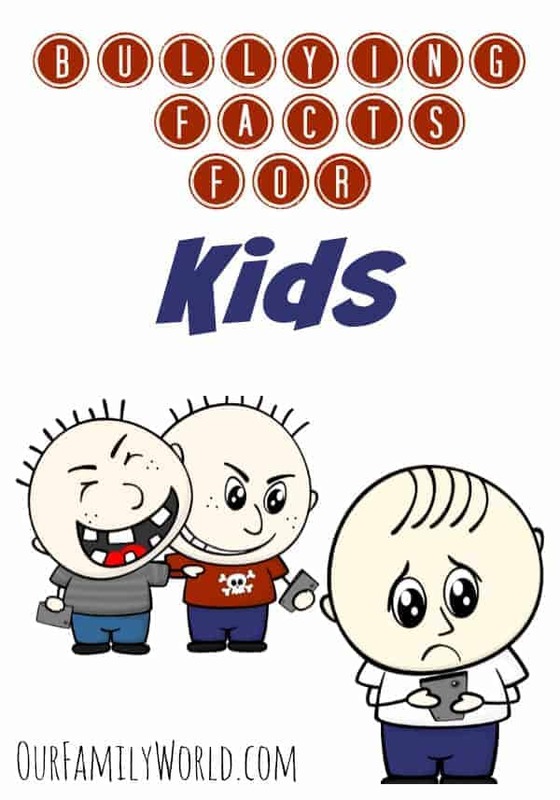 These bullying facts for kids are more of a guideline to use in helping them understand it is a real issue they need to address and fight against. Stand with your children and fight the war on bullying together. How will you use these bullying facts for kids to make a difference in the fight against bullying? Do you have any other facts you’d like to share? That is so true. Bullies come in all forms, even friends. I think this is a good approach. Needs to be understood by all. Thanks for the info – I will definitely be sharing your post with the kids. I am believer that discussing and educating is the key to stopping bullying. Teachers bully too. In fact I have had to step in and put an adult in their place because of this. It is so important that a school has a strict policy on bullying especially with younger children! I worry about this all the time. My kids school has a zero tolerance for bullying. It is addressed every year. And we teach our kids to stand up for everyone especially if no one else will. I agree that bullying is such a big deal. I’ve seen its emotional impact on my daughter first hand. I also think it can start in the home too. If a parent or sibling bullies a child they can mimic what they are around. Thank you SO much for bringing much-needed awareness to this topic. No child should ever have to suffer from being bullied. We as adults need to do a much better job setting a good example! It’s great to start this discussion when kids are young. Bullying needs to stop! These are facts that need to be stressed to our children. Some children don’t realize bullying is still bullying even if it’s coming from their friends. Cyber Bullying seems to be the in thing these days. People of various ages sit at their Computers and say mean things to people they don’t even know. I’m glad you are discussing the subject from an early age. My son dealt with bullying in the middle school. It wa awful so thank you for bringing awareness to this. Such an important topic! Great job on giving information on bullying! I think these are some of the reasons why it’s addressed by school officials so rarely. “Friends” do it too! Thanks for this. Bullying is really getting out of hand and especially with social media. Wish kids would just all get along. It’s so sad that our kids these days have to deal with SO much bullying- really sad. It’s definitely good to raise awareness and talk to our kids about this. I agree your friends could be teasing you not realizing it is really hrting your feelings. Had a situation recentluy with my daughter and told her to tell her friend. That is a really horrible statistics about teachers not taking bullying seriously. How are kids supposed to feel safe? We really do need to talk to our kids often and let them know that we support them. I wish we lived in a world where there was no bullying. I Hate to think of kids being mean to other kids. Wow…I’m shocked and saddened to hear the statistic that 1 in 4 teachers think there is nothing wrong with bullying or that it isn’t prevalent in schools?! That seems out of touch with reality. Thankfully, my children’s school has a very proactive approach to handling bullying. Even with that priority, there is still plenty of incidents and circumstances where I have overheard bullying in our school. These are good things to discuss with children who may be subjected to it every day at school! Thank you! You kids have dealt with bullying so much I’m always looking for new things and ways to discuss with it them. This is great!